After months of bare trees and snow-blanketed landscapes, the world is bursting into bloom with the arrival of spring. And with a new season comes fresh design inspiration, courtesy of Mother Nature herself. 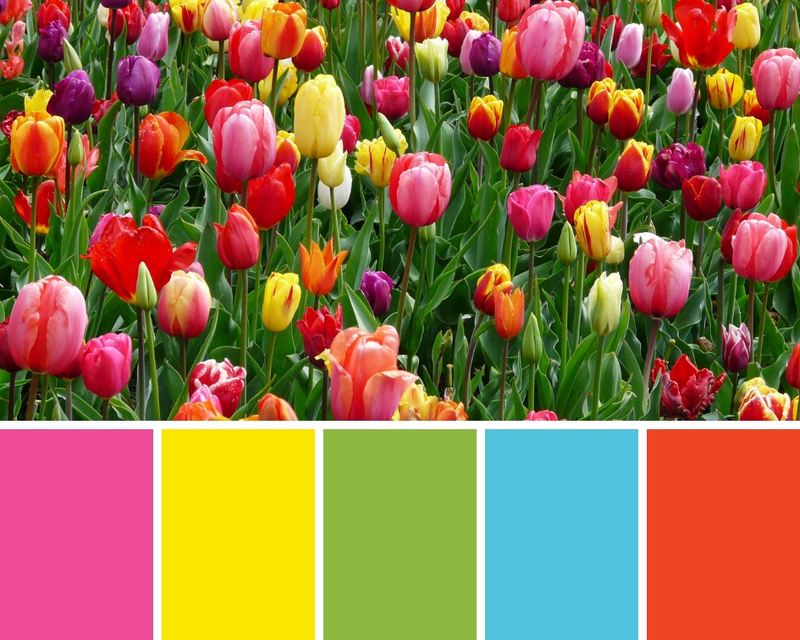 Spring is the perfect time to inject life and vitality into your next design project with accents of bold, bright colors that you might otherwise shy away from. 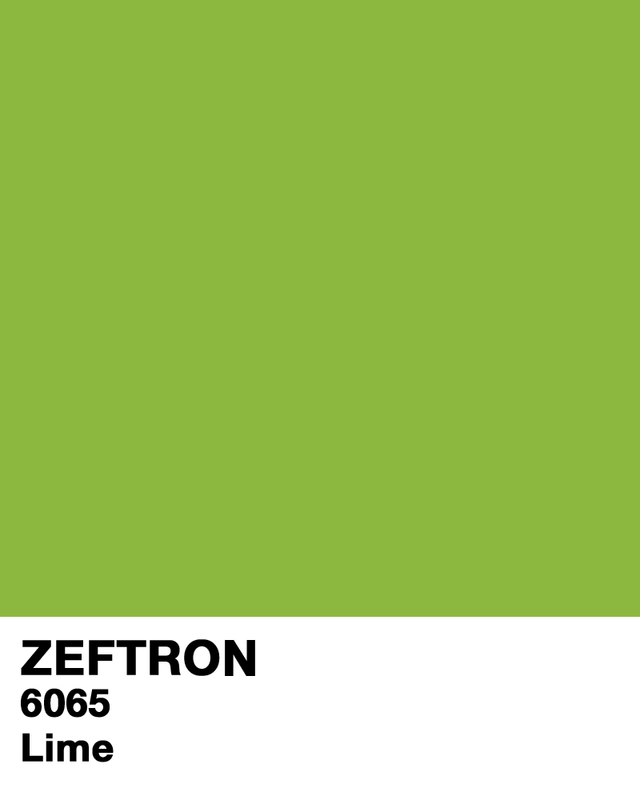 Follow the lead of the natural world with these five, springy colors from Zeftron’s Brilliance Collection. Lemon: You know spring is on its way when brave, sunny daffodils poke their way up out of the snow. These bright yellow flowers are the first promise of spring and their warm, energetic hue is the perfect way to capture the hope of the season in your next design. The positive emotional associations and energizing effects of lemon yellow make it a wonderful accent in health and wellness spaces, where it evokes the excitement of new beginnings. Electric Blue: While April showers bring May flowers, the longer sunlight hours of spring also bring a bright blue sky that provides a welcome break from the gray clouds of winter. 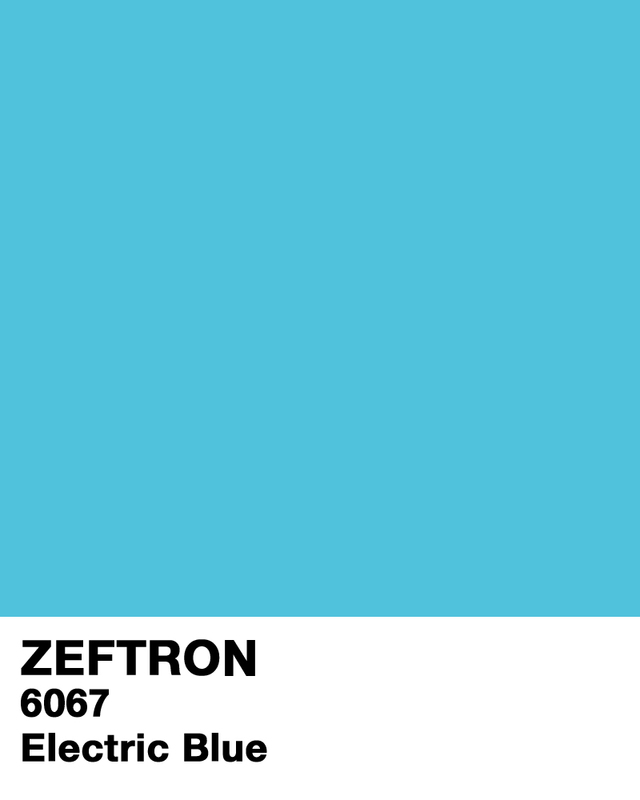 Electric Blue is an invigorating twist on the usually tranquil shade and is perfect for calling to mind the openness of clear water and freedom of a far-stretching sky. Maybe that’s why many transportation, communications, and tech companies have embraced this hopeful hue. Lime: As the weather grows warmer and the natural world comes back to life, the bare branches and ground of winter give way to a refreshing green. It’s no surprise that green, especially its bright lime shade, is associated with growth, nature, and fertility. If the daffodil’s yellow petals are the first sign of spring, green grass and bright leaves signify that the new season is here to stay. Lighten up the emeralds and hunter greens of fall and winter designs with an accent of their brighter cousin to invoke a feeling of renewed energy. Hot Pink: Across the globe, the beginning of spring is marked with festivals and celebrations to one of the season’s showiest spectacles: the cherry blossom. These delicate pink blooms appear just as spring arrives, blanketing trees from Japan to Europe to our nation’s capital. Capture the sweetness of this natural wonder in your next design with playful pops of hot pink, inspiring everyone who sees it to feel a little lighter and younger. Brilliant Orange: As spring reaches its zenith and moves towards the warm, lazy days of summer, tulips spring up in every shade of the rainbow. 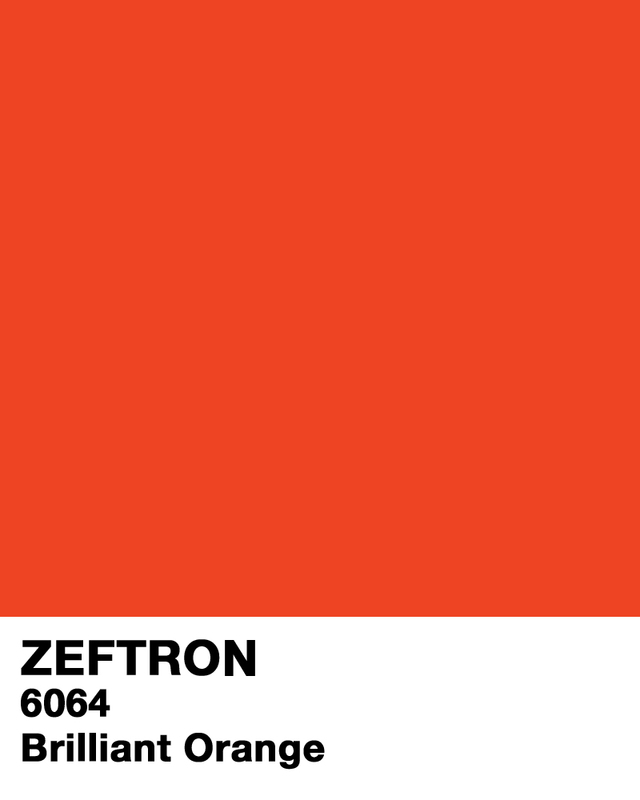 But one of their most standout colors is vivid, brilliant orange. Like the yellow of daffodils, orange’s warmth evokes the sun’s optimism and energy. 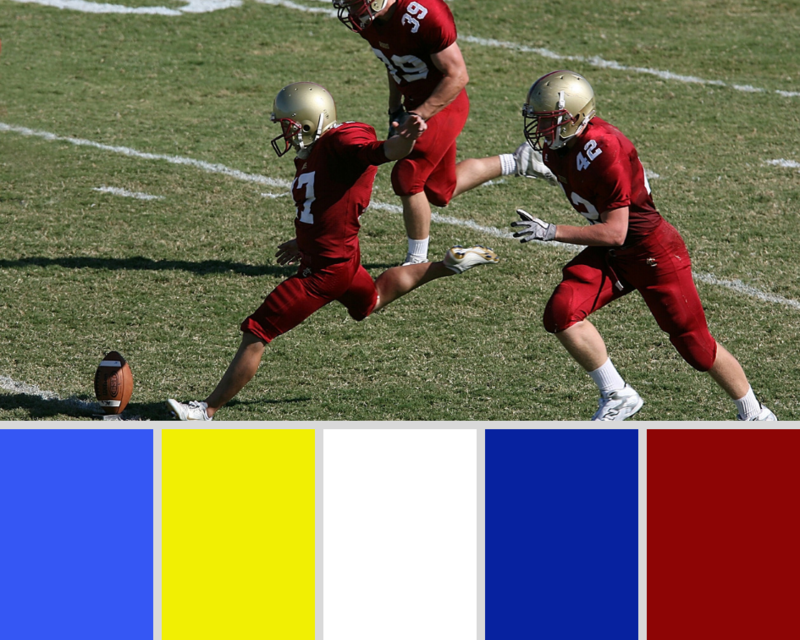 It’s often used by sports teams to invigorate players and fans alike and can do the same for your next design project! When choosing flooring for your design projects, it’s easy to get caught up in the debate of carpet versus hard surfaces. And though we’re partial to the beautiful versatility of carpet, we know that it doesn’t have to be an either-or decision. Both materials can co-exist to maximize an aesthetic appeal and functionality of any space. 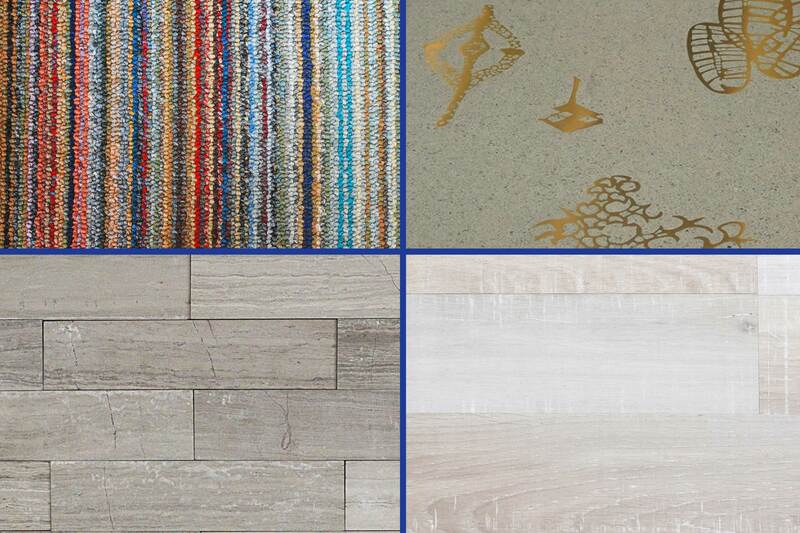 Here are five reasons why you should consider mixing multiple flooring options into your design. If you’ve ever entered a space only to be met with a mass of people standing around or moving chaotically in all directions, then you know how helpful traffic pathways can be in a design. 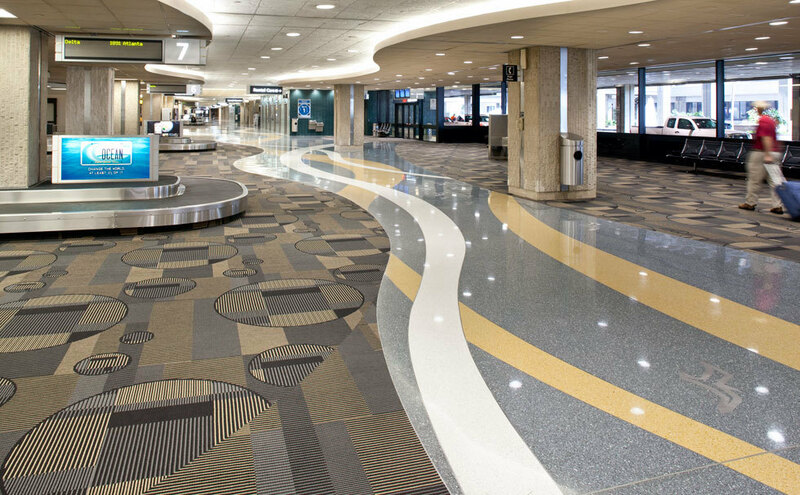 Using hard surfaces bounded by carpet creates walkways that both visually and intuitively guide visitors through a space. 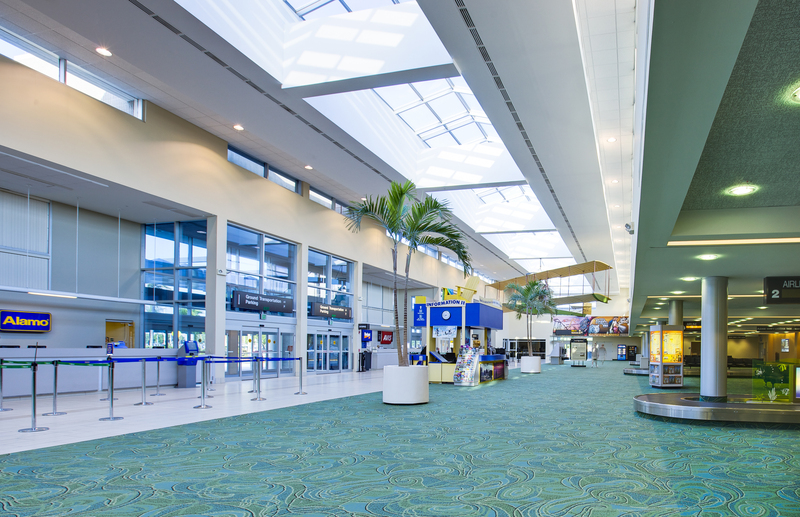 The comfort and vibrancy of carpet invites visitors to relax in seating areas while stone, tile, and hardwood encourages movement and can clearly direct visitors through the areas of moving traffic. The combination of the two materials naturally guides visitors through the space while decreasing congestion and frustration. Carpet naturally creates a sense of comfort that invites visitors to relax, which is why it’s the perfect accompaniment to couches and lounge seating. Think of the psychological shift when you come home for the day and kick your shoes off, digging your toes into lush carpet. Can’t you just feel your body instantly relax? The same effect can be applied to commercial spaces. 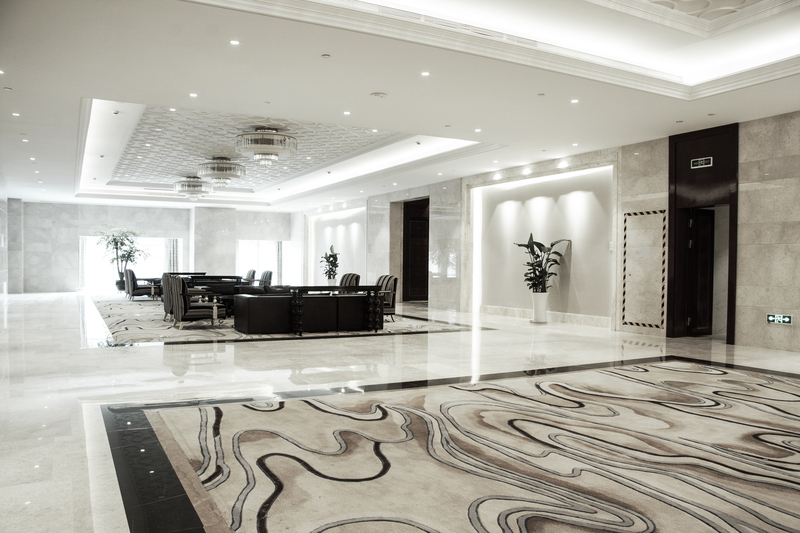 Whether it’s the waiting area of an office building or the parlor-style lobby of a hotel, the contrast between hard surface and carpet invites a psychological shift to relax. When it comes to executing your vision, you do not have to be limited to a single flooring option. By combining carpet with hard surfaces in your design, the possibilities are endless. Maybe you love the natural texture and movement of marble but wish it could be enhanced and highlighted. Creating a custom carpet pattern that matches the natural tones of the marble and a prominent pattern that mirrors the veins of the stone can do exactly that. In the best designs, each element complements each other, combining and playing together like a beautiful symphony. From the architecture to the furniture, it all adds up to a cohesive whole that leaves visitors with an intuitive sense of the space’s identity. Combining hard flooring with carpet can be a great way to enhance the sense of place. From evoking natural settings to mirroring the soaring heights of the architecture, these materials can harmonize perfectly. Contrast is an excellent way to draw the eye and create focal points within a design. By shifting from one flooring material to another within a single space, visitors are invited to focus on unique details with specific purposes. That purpose could be practical, like the wayfinding mentioned earlier. Or it could be entirely aesthetic, drawing attention to unique art pieces, elements of architecture, or unexpected details. Never hesitate to act on your inspiration! Walk through a winter wonderland where colors abound. Created with longevity, value and powerful pigmentation in mind, Zeftron nylon has 120 color options for you to draw inspiration from this season. 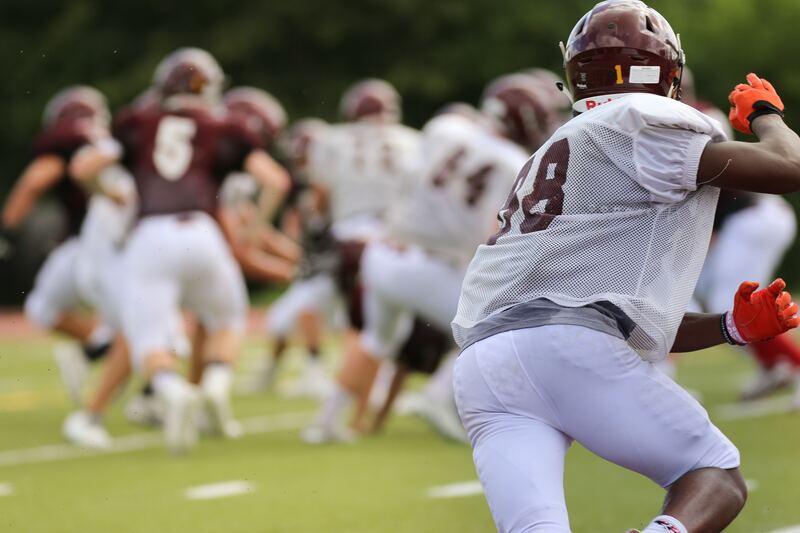 Now that the leaves have fallen and the temperatures have dropped, it’s time to strike while the iron is hot. 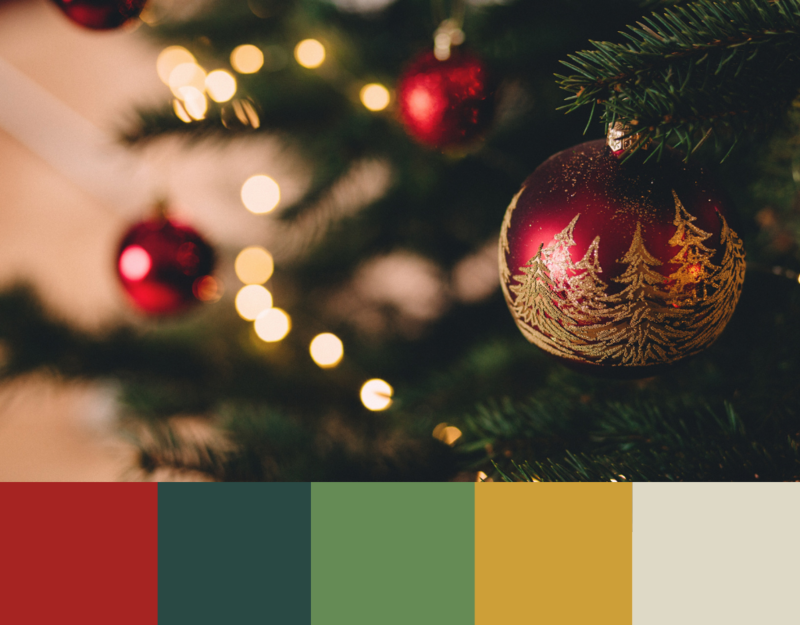 Here are five colors from our winter palette that are sure to shoot your designs to the top of the nice list. Similar to Regal Red (6134) in our fall palette, Clear Red will act as a powerful accent to your dark greens and neutrals. This shade will be sure to stand out on your palette this season. Evoking the essence of Christmas cheer, this striking tone reminds us of a certain famous reindeer you may have heard of. We love the versatility of Hunter Green. It can squeeze its way into your palette year-round. There will always be a place for this shade. Earthy and stark, this color is a winter win. Dark, with subtle hints of blue, you’ll have to squint to capture all the beauty of this green. Grass is a perfect contrast to our Hunter Green. Use this color to inject youthful energy into your next project. You may recognize this shade from the highlights on your Christmas tree. Bright and bountiful, this color works as an accent or the star of your show. A crowd favorite, Gold is the ultimate accent color for your next installation. The shade shines brighter than the brightest string lights on your local block. Gold is an eye-popping crowd-favorite that will draw “oohs” and “ahhs” this season. Bright Ivory is the perfect muted, neutral tone. Bright Ivory will work just about anywhere and is calming to the eyes. Use the tone as you wish and let your imagination run wild. Allow it to serve as a base for your design and let one of our other 119+ colors do the talking for you. If you’re interested in learning how commercial carpet made with Zeftron nylon can help you achieve the look and design you need for your next project, please visit our Design Process page. Happy Holidays from your Friends at Zeftron Nylon! Earlier this week, Zeftron attended one of our favorite events of the year, BDNY. We were there supporting our mill partner Encore Hospitality Carpet to help them show off several new exciting products made with our nylon. And as always, we enjoyed spending quality time with some of the industry’s top designers. The Encore Hospitality Carpet and Zeftron teams pose for a photo during this year’s BDNY Expo. New York City and BDNY were the perfect place for the debut of Blur, a new carpet collection that combines dynamic textures with multiple colors and unique designs. Made from Zeftron Nylon, Blur brings excitement, movement, and energy to everything from guest rooms to ballrooms to hallways. It really does capture the constant motion and energy of a big city like New York. Blur uses Encore’s advanced Colorpoint and Infinity Technologies to provide 18 different patterns and six colors for public spaces with a super-durable 42oz weight. In guest rooms, designers can choose from an infinite combination of pile heights and design repeats with four pattern and color options. Encore also previewed several other products that designers can use in various hospitality settings thanks to their alluring patterns, color options, and custom capabilities. The Interweave Collection is a great solution for public spaces and features 3 color patterns and 6 pattern designs across 12 or 15 foot repeats. For guest room areas, Encore previewed four stylish products—Connect, Sooth, Boutique, and Retreat—all of which feature Zeftron Nylon and are made with Encore’s innovative Colorpoint Technology. If you’re interested in seeing any of the Encore products made with Zeftron showcased at BDNY, please visit Encore’s website at www.encorehospitalitycarpet.com. Here you’ll find product details as well as various room scenes to spur your imagination! If you’d like to see photos from BDNY, check out our social media channels! 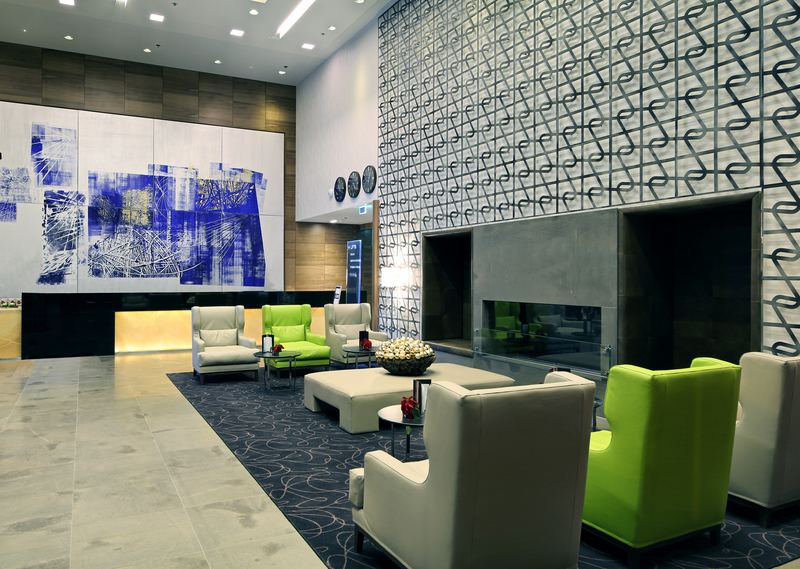 As any designer knows, color plays a vital role in design. The right color or color scheme can evoke emotions, change perceptions and even create a memory that will last a lifetime. Since a floor is often the largest visual space in a room, choosing the right color for this “canvas” helps set the design foundation for the space. With Zeftron nylon’s extensive color palette of 120 options, it’s easy to find the perfect color or colors for your commercial carpet. Saturday, September 22, ushered in the official first day of Fall. Soon leaves will begin changing colors and many of us across the country will celebrate that special time of year when everything around us seems to be fully alive with a multitude of colors. As an ode to that most colorful time of year, here are five autumnal colors from our color palette, which we hope can inspire your creative thinking for your next project. Coffee– Perhaps no other color is more associated with autumn than a deep, coffee-colored brown. This smooth, calm color can serve as a strong primary color for a commercial carpet, working exceptionally well in traditional workplace environments such as corporate offices, financial service firms or within law firms. Regal Red– Evoking the brightness of a red apple picked at its ripe zenith, Regal Red can infuse any space with a zap of energy. When used as an accent color with a more traditional black or brown-hued carpet, Regal Red can bring any space alive. Natural Bark – A brisk walk in the cool fall air along a wooded path brings Natural Bark to the forefront. Simultaneously tranquil yet strong, this intriguing color with depth and dimension brings a sense of warmth and an organic feel to any space. Apricot– This color says it all. Depending on the space, Apricot can serve just as well as a primary color or as an accent color. This trend-forward color embodies the soothing essence of nature, and can help bring the healing powers of the outside into your commercial space. Terra Cotta – Organically inspired, Terra Cotta combines the warmness of its red hints with the power of a darker hue. The result? A color that can positively affect the mood of a space while also helping accentuate the furniture and furnishings of that space. Here’s wishing you all a bountiful season of color and great design! On Wednesday, July 18, Zeftron Nylon hosted a wine and cheese networking event at architect and design firm, Fogarty Finger, in New York City. 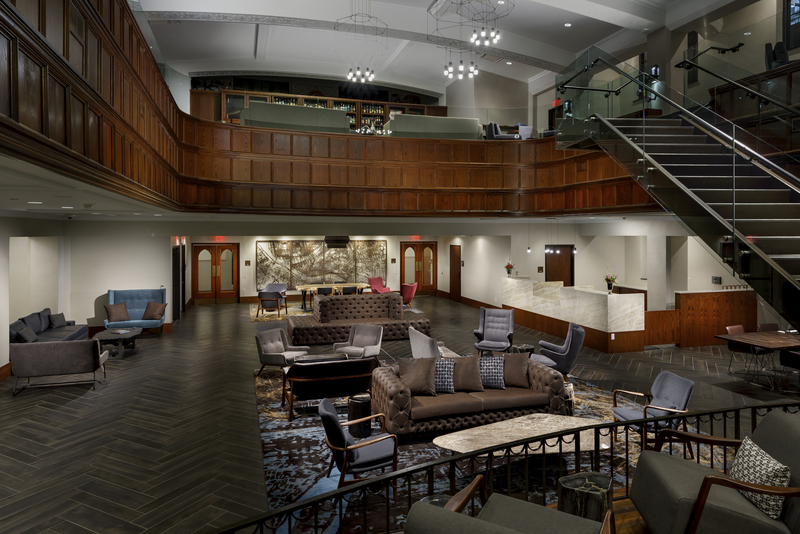 The event was held to showcase how Zeftron and its partners, Bloomsburg Carpet Industries and Koraseal Interior Products®, cater directly to the commercial interior design market. Representatives from all three companies met with designers to mix and mingle, share what’s new in the marketplace, and introduce themselves as a resource for future design projects. While sipping wine and enjoying light snacks, attendees were allowed to tour Fogarty Finger’s showroom to see how Bloomsburg’s carpets made with Zeftron could be paired with Koraseal’s wallcoverings to create a dazzling commercial space. Bloomsburg Carpet Industries is universally recognized as an industry leader in luxury, quality and innovative carpet design by consistently introducing new colors, textures and patterns that enhance both traditional and contemporary commercial and residential spaces. The company was founded in 1976 by Raymond P. Habib in Bloomsburg, Pennsylvania. Koroseal Interior Products is an Ohio-based leader in contract wall covering and interior products, producing some of the most recognized brands in the interiors market today, including: Koroseal® and Vicrtex® wallcoverings, Korogard® wall protection and Walltalkers® dry erase presentation wallcoverings. Zeftron was pleased to host this very special event and is happy to coordinate a similar one for other designers in the future. If you’d like to know how we can work with you in the New York area, please contact Chelsey Wolf at chesley.wolf@zeftron-nylon.com. For other areas contact Richard Radke, Zeftron National Marketing Manager, at Richard.Radke@zeftron-nylon.com. To see all of the other ways in which we support our mill partners and the commercial design community, please visit www.zeftronnylon.com or follow us on social media!